Next to the gardens, the Albuquerque Aquarium follows a journey down the Rio Grande River from Albuquerque to the Gulf of Mexico. From fresh water riverine to deep ocean marine habitats are highlighted along the journey. Moon jellies mesmerize at my favorite exhibit. But, it’s hard to ignore the seemingly sinister residents in the shark tank – brown, sandtiger, blacktip and nurse sharks. The Rio Grande Zoo offers close encounters with over 250 species of native and exotic animals. 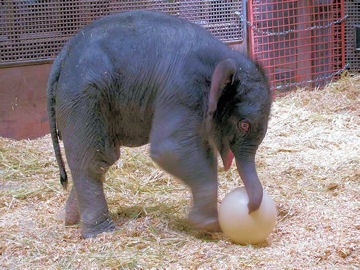 One of the newest additi ons is Daizy, a female Asian elephant calf born September 2, 2009, weighing in at 318 pounds. Most days visitors can meet Daizy and mom Rozie in the main elephant yard between 10am-noon and 2-4pm, depending on the weather and baby’s energy. Popular zoo features include Tropical America, Gator Swamp and Africa filling six acres with 17 separate exhibits. Photo of Daizy courtesy Rio Grande Zoo.